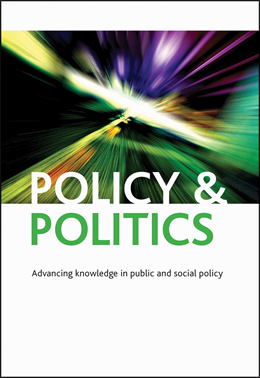 Virtually every major theory of policy making suggests indicators and other forms of information play an important role in stimulating issue attention and provoking policy maker action. My recent paper, “Indicators, agendas, and stream: Analysing the Politics of Preparedness,” applies the Multiple Streams Framework (MSF), which argues policy change is facilitated by the coupling of three distinct streams: (1) the problem stream, which consists of the various social issues competing for policy maker attention; (2) the policy stream, which encompasses the various policies and programs designed to address items in the problem stream; and (3) the politics stream, which broadly describes the current political environment, including trends in public opinion as well as the composition of government. Coupling is aided by a policy entrepreneur or an individual or organization willing to invest considerable amounts of time and energy to secure policy change. Once the three streams are coupled, a policy window is opened providing organized interests with an opportunity to push their pet issues onto the policy agenda and, ideally, secure policy change. According to MSF, indicators are one of a number of mechanisms through which problems are revealed to the public, media, and policy makers. Whereas the overwhelming majority of previous MSF studies qualitatively assess the relationship between indicators and agenda setting, my recent Policy & Politics article devises a quantitative model. It specifically examines recent influenza (avian and swine influenza, more specifically) and Ebola policy making. Cases of emerging diseases are readily tracked and tabulated, making these domains an ideal setting for investigating indicators and agenda setting. Rapid indicator accumulation: In this instance, indicators amass quickly and in large quantities, often over a period of months, if not weeks. The 2014 Ebola epidemic, for example, was more than 15-times greater than all previous outbreaks combined. Rapid indicator accumulation almost always results in issue attention and, at least with respect to emerging diseases, signifies the dawn of a large-scale crisis. Rapid accumulation events speed their way onto the policy agenda. However, it is not always a recipe for actual policy change. In the pandemic influenza and Ebola cases, rapid indicator accumulation did not provide sufficient time for policy entrepreneurs to mobilize and the streams to converge. Instead, government officials were more concerned with managing the existing crisis, not devising new laws and programs. Gradual indicator accumulation: This pattern sees indicators amass slowly and in much smaller quantities over a period of months, if not years. For example, small outbreaks of avian influenza plagued Southeast Asia from 2004 to 2007, but the virus never mutated into a pandemic strain capable of triggering a large-scale global pandemic. Gradual indicator accumulation is forward looking and suggests the possibility of looming—and much larger—events. In many instances, policy makers ignore gradually accumulating indicators. Policy makers disregarded the various Ebola outbreaks of the 1990s and weren’t particularly interested in the virus until the 2014 Ebola epidemic. However, when and if these indicators do, in fact, facilitate agenda setting, then the likelihood of substantive policy change is much greater than in the instance of rapid indicator accumulation, as evidenced in the avian influenza case. The gradual accumulation of avian influenza cases and deaths slowly stoked the possibility of a larger pandemic event emerging, allowing for the development of policy solutions, the emergence of policy entrepreneurs, and the cobbling together of coalitions and votes. Information and indicators matter, but only sometimes. Whether or not the outbreak of a new disease triggers a government response is ultimately determined by a host of contextual and political factors that transcend the “objective” value of data, statistics, and cases counts. Evidence translation: an exploration of policy makers’ use of evidence.